For anyone who has reached their saturation point on Dory and Nemo this summer, I apologize (though I do question it!!). But, if you’re here on this blog, chances are you agree that Dory is one insightful sweetheart of a blue tang! One day, I was playing the soundtrack to “Finding Nemo: The Musical,” (the show at Walt Disney World) and when I heard Dory sing, ” Trust that if you just keep swimming, just keep swimming, life isn’t all that grim,” it resonated in a whole new way. At times I felt completely overwhelmed by the amount of assistance Ben required within the limitations of our very small NYC apartment. At times it was emotional- it was devastating to see Ben struggle to do things we all take for granted- use his fingers, his hands, his legs, swallow. ALS is a cruel disease. Sometimes my own physical challenges in helping him became overwhelming- he needed to be transferred to and from bed and chairs, among other things. There were the times I had to call 911 for help. Thankfully, Ben did not get physically hurt during those incidents, but the emotional toll was painful. I broke my shoulder in 2012, and had been in physical therapy for more than 2 years with back problems, so at times we simply had to laugh at my unskilled and klutzy efforts to demonstrate physical strength. I just had to remember to “just keep swimming, just keep swimming, just keep swimming.” Somehow, picturing Dory saying that was so much more motivating (and cuter!) than just trying to run a recording of my own voice in my head. I had to think fast, or at times not to think at all, but just dive into auto-pilot. This is not to say that I “kept swimming” in good cheer all the time. As incidents arose, sometimes through tears, I would get the job done. I had my breaking points, emotionally and physically, but I kept going. In retrospect, it kept Ben confident and comforted that I was reliable and devoted support, and it inspired me to try to stop thinking so much about worst case scenarios, because I seemed to just swim through them. I had to go with the flow with my dad, too. He had cancer but was also elderly and living alone. He was very nervous about being ill. We spoke on the phone many times every day. I took a train to see him at least every weekend, and would do his food shopping and take everything on the train when I visited. I would go to his local store to pick up other things. During my free time at work, I called him to check in and remind and encourage him to eat. There were times that I would hang up the phone and just cry. But, when I could pull myself together, I would come up with a plan. It wasn’t always a great plan, and I sometimes felt like I was belly-flopping, but it kept us swimming. In my grief, I also find that I have to just keep swimming. I have bad days and better days. I have indeed let the undertow drag me down at times. But, it has been nearly a year and I have managed to keep my head above water and not drown. (how am I doing with the swimming references?) I have great friends and have participated in support groups where I have met lovely people with whom I am still in touch. Some of the amazing people who took care of Ben are still there for me, for which I am incredibly grateful. I now see more glimmers of good days. 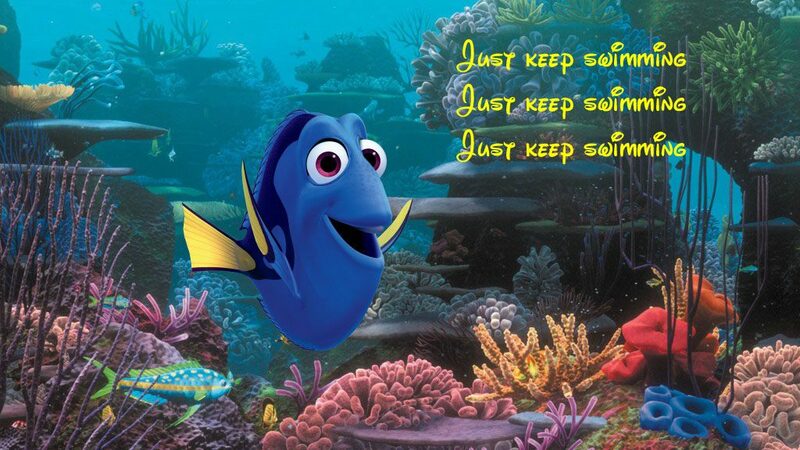 Dory had some great advice that has helped me to go with the flow as I adjust to and redefine my life. I hope it helps you, too. Who’s a Silly Old Bear? How often as a caregiver do you feel a sense of helplessness and ineptitude? For me, it was pretty frequently. That is why I started this blog. Disney has been a way that I’ve found inspiration and strength as a caregiver and in my grief. There has also been some welcome joy and laughter when I never believed it possible. I wanted to share this with other caregivers, and I encourage your participation in this blog as a way to express and validate our feelings, and to support each other as we find ways to move forward. I haven’t found “the” answers, and I’m not an expert seeking to impart formulas for moving forward with grace and serenity. But, I can promise that this silly old bear and his friends in the 100 Acre Woods, as well as their Disney buddies, are pretty insightful and, especially if you are a Disney fan(atic), they will always bring a smile and comfort! In my own experience, my husband, Ben, had ALS/Lou Gehrig’s disease, and at the same time my father, Jacob, had cancer. During the crises, or the exhaustion- physical and/or emotional- I definitely did not feel brave, strong or smart. I often I felt like I was running in circles and going through motions to get through each event. But, saying that quote to myself gave me something to hold on to. It became a kind of mantra for me and it never failed to make me smile. Say it. And say it again. I cannot tell you how many times it has helped me and I have fallen asleep to the DVD, “Winnie the Pooh and the 100 Acre Woods.” It has become like a lullaby and I highly recommend it. Can you relate to this quote? Please share your stories. Thank you! And welcome to my blog.